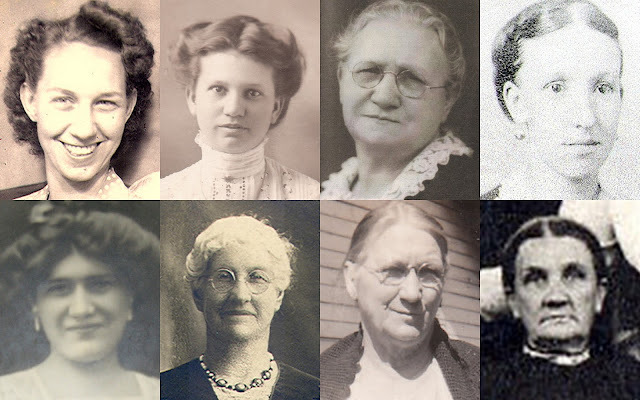 For International Women's Day I'd like to remember and honor my female ancestors, a few who appear above. As far as I know none of the ones above changed the world in a broad, huge way -- no national heroines among these ladies -- but I know they changed and bettered the world in which they lived, improving their lives and situations and the lives of those they loved, including neighbors and friends. All survived hardships, heartaches, and other difficult challenges. Two lived through travel from England to the U.S. All but one lived through at least one war and several scrimped and saved through the Great Depression. One suffered dementia, another skin cancer, and seven of them lived into old age. For them, and all the other women in my ancestral lines, I am grateful, knowing that if one of them had not lived I wouldn't be here. Thank you, Mom and grandmothers. P.S. I know International Women's Day was celebrated yesterday, Wednesday, March 8. Computer problems and inaccessible photos prevented publishing a post yesterday.